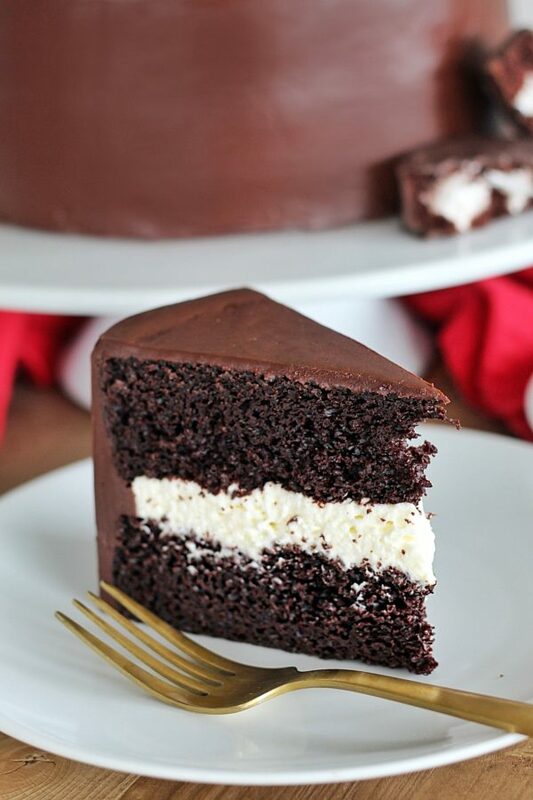 Ding Dong Cake – layers of dark chocolate cake, whipped cream filling and chocolate ganache. As I was thinking about this cake, I couldn’t believe how long it’s been since I’ve actually had a Hostess Ding Dong. I used to love them growing up! 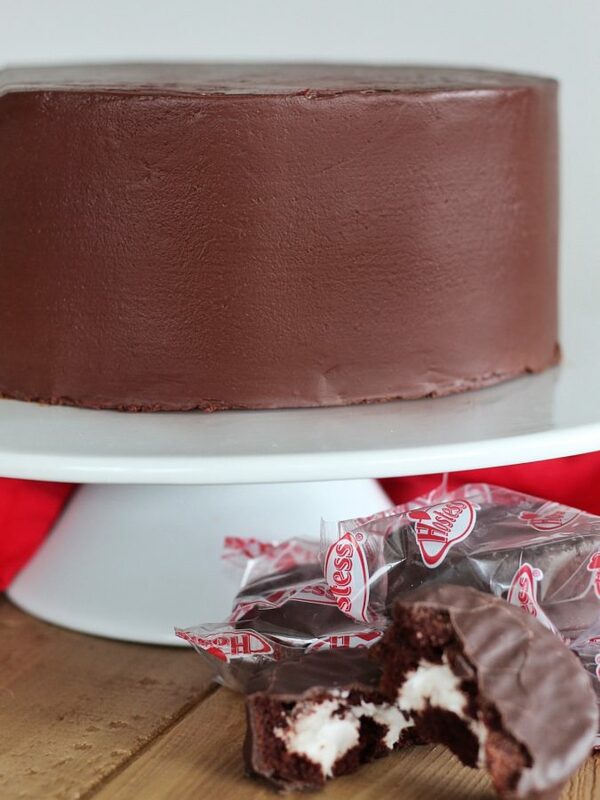 Chocolate cake with cream filling and chocolate ganache – who doesn’t love that combo? I decided that it was a crucial step in research to buy a pack of Ding Dongs for taste testing and comparison once my cake was completed. As soon as I got home from the store, I opened up the box, eager to relive my childhood with a single bite of the mini chocolate cake. However, like many of you, I was so disappointed to see my favorite treat was no longer wrapped in its signature foil covering. I know Hostess was bought by another company, but couldn’t believe they took away part of what made this treat so identifiable! And that wasn’t the only disappointment! One bite into the cake and I just about spit it out. It was so dry and not like anything I remember it being. I had to laugh though, because my kids both downed one in seconds! And now they’re asking for Ding Dongs in their lunches! So maybe it’s a kid thing and now that I’m an adult, I’ve lost the magic of Ding Dongs. With my research complete, I started whipping up my own version of a Ding Dong. To stay true to the real thing, I used my chocolate cake recipe in two 8-inch layers instead of my usual three layered cake. You’ll notice in the cake instructions below that the oven temperature and bake time are different than what I would normally suggest for my chocolate cake when it’s in three pans. Because we are putting so much batter into each pan, we need to bake it at a slightly lower temperature for a longer time so that it bakes more evenly and doesn’t get over baked in some areas. For the cream filling, I made a basic whipped cream and add gelatin to give it stability. You’ll see this step in the instructions and please don’t skip it. 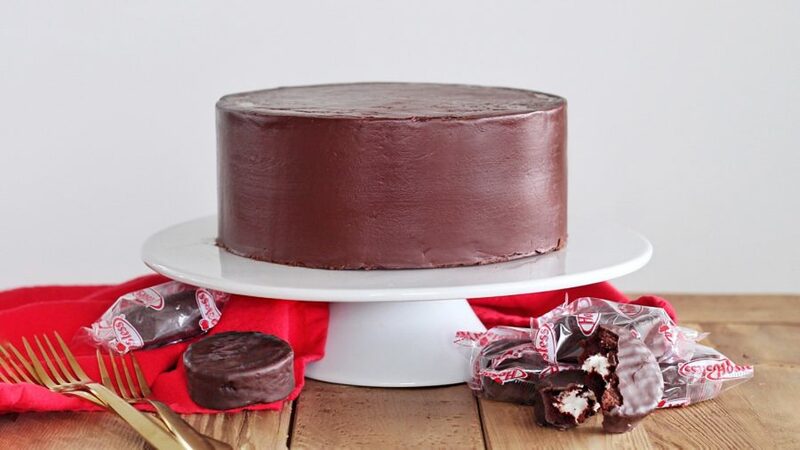 Whipped cream on it’s own, even with some powdered sugar in it, won’t be strong enough to hold the top cake layer and you’ll have cream oozing out your sides and into your ganache if you don’t add the gelatin. For the ganache, it’s just dark chocolate and heavy cream melted and mixed together. Even when it cools, it will still feel soft and that’s ok. I suggest starting with chilled cake layers (always) when you stack your cake. 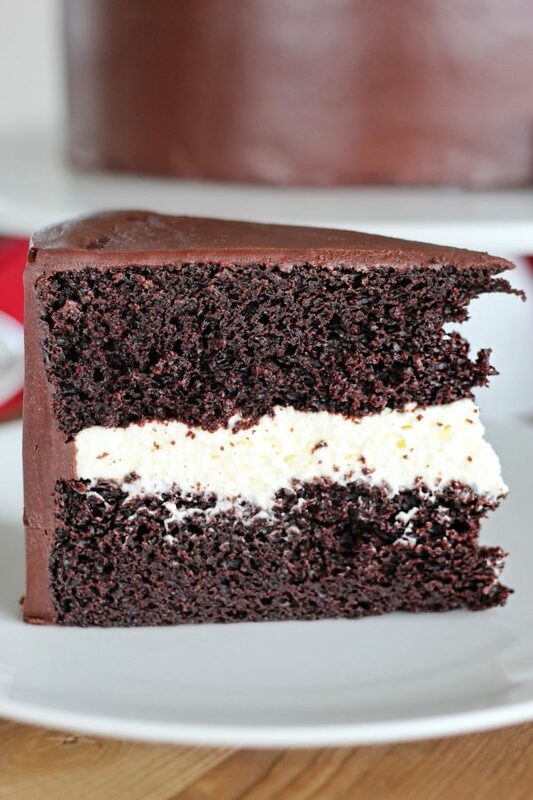 After you’ve stacked the cake layers, apply a thin layer of the ganache around the cake and then freeze it, just like you would with any other cake to set the crumb coat. This will make your cake more stable as you finish frosting it and it helps the final coat of ganache to set since it’s going onto a chilled cake. 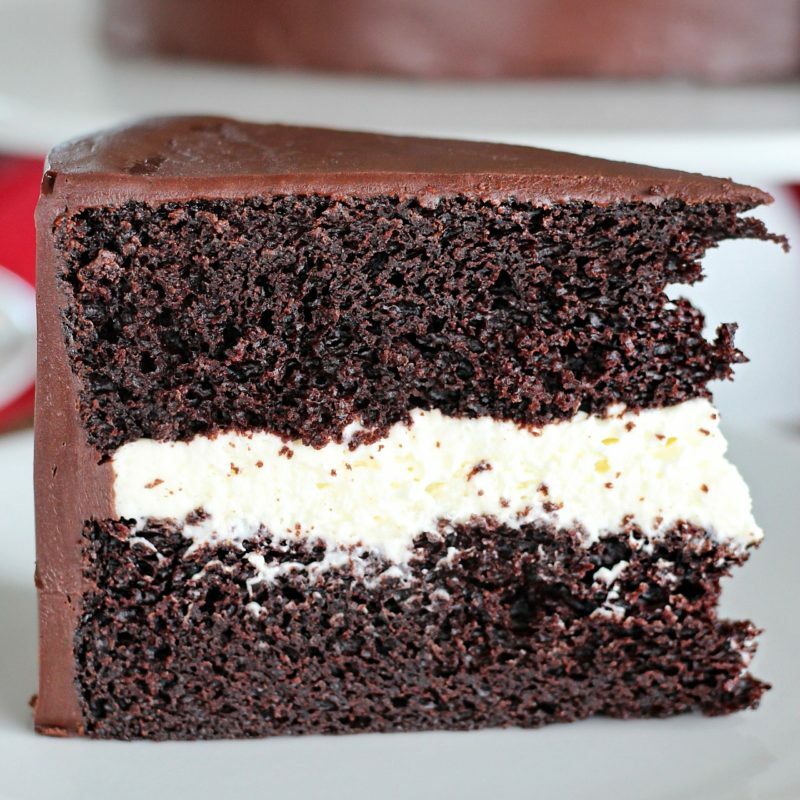 Chocolate cake layers with whipped cream frosting and chocolate ganache. Preheat the oven to 325 degrees F. Spray two 8-inch round cake pans with nonstick spray, line with parchment paper, then spray the parchment paper as well. Set aside. In another bowl, combine the buttermilk, oil, eggs, water and vanilla. Mix lightly until combined. With the mixer on low speed, slowly add the wet ingredients to the dry. Scraping the bottom of the bowl with a rubber spatula, and mixing for 30 more seconds on medium-low speed. Evenly divide the batter into the two prepared pans (about 22 ounces in each pan) and bake for 25-30 minutes, until a toothpick comes out with a few moist crumbs. Cool in the pans for 15 minutes, then turn them out onto a cooling rack and cool completely. In a small bowl, place the cold water and sprinkle with the gelatin. Let sit for at least 10 minutes. In a small saucepan, bring 1/3 cup heavy cream to a simmer and then stir in the gelatin mixture. Refrigerate, stirring frequently, until cool but not set, about 5-7 minutes. In a chilled stainless steel bowl with a chilled whisk attachment, beat the remaining whipping cream, icing sugar, and vanilla until it thickens and soft peaks begin to form, about 1 to 2 minutes. Very gradually add the gelatin mixture and continue beating until medium-firm peaks form. Keep covered and chilled until ready to use. Heat the cream in a microwave safe bowl or in a double boiler. Pour the cream over the chocolate chips and begin to stir to melt the chocolate. Continue to stir until you have a smooth, silky consistency. Allow to cool before using on your cake. Place your first cake layer, top side up, on your cake plate or cake board. Gently spread the whipped cream filling over the cake layer. It should be about 1/2 - 3/4 of an inch thick. Place the second cake layer, top side down, on the cream filling. 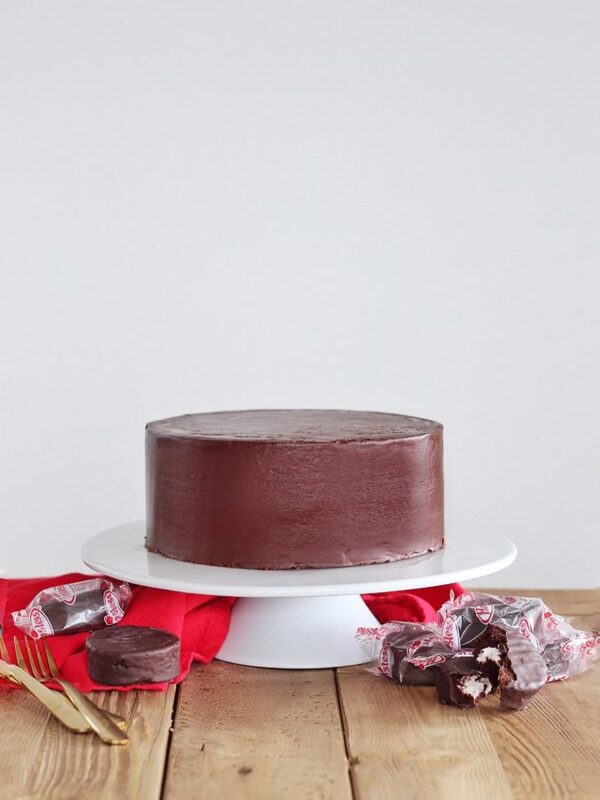 Lightly frost the sides and top of your cake with a thin layer of chocolate ganache. This is the crumb coat. Freeze the cake for 15 minutes. Continue to frost the cake with the remaining ganache. Just double checking… 2 cups + 16oz dark chocolate chips for the ganache? Or just 2 cups? Do you usually use a Dutch processed cocoa or natural? Or even a specific brand you prefer? I love Guittard dark chocolate or Extra Brute Cacao Barry but any dark chocolate will work. I don’t use dutch. For the ganache you have it labeled as 2 cups 16 oz. I was confused if that meant 2 cups which is 16 ounces or if you were to add them together??? I made it today and it seemed thin but I’ve never made ganache before. It was amazingly delicious! Thank you! Quick question??? Dutch processed cocoa powder or regular Natural??? In the instructions for the whipped cream filling, it says salt but salt is not on the ingredient list for the filling. Should there be salt? If so, how much. No salt. Sorry about that!